These convenient sets combine hitch-tending pulley, carabiners, and appropriate hitch cord for different diameter ropes. You save a couple bucks, and get a selection of climbing gear you can count on to work together well right out of the box. The Phlotich pulley from ISC is the perfect mate for your Rope Wrench and also can be the heart of a MRS system. The unique 'kidney' aperture accepts one or more carabiners, allows multiple connections, and permits the carabiner to self-center to the load. This kit packages the Phlotich with 9mm Bail Out XL prusik (30") and two ISC Offset Oval carabiners which gives you a flexible setup that will work well on a wide range of ropes, and saves you a few bucks! The Hitch Climber is the single most popular pulley for organizing a hitch system, thanks to the 3 holes which streamline the system, and open up additional tie-in options for advanced uses. 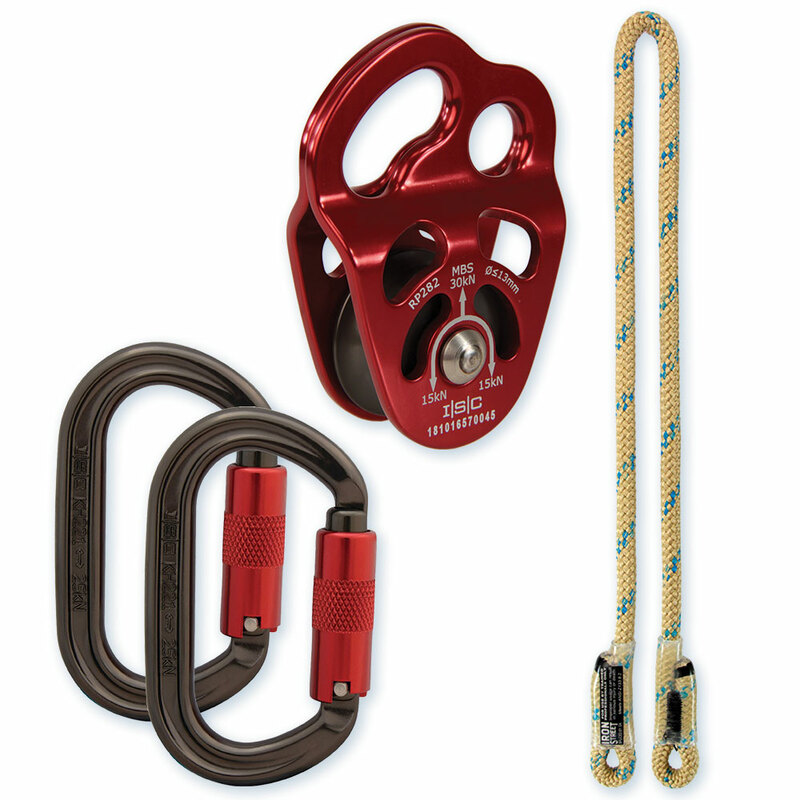 Grab a Hitch Climber set and get the pulley, oval carabiners, and hitch cord all in one go. Match up the prusik diameter with your climbing line: 5/16" prusiks will work with 7/16" ropes, 3/8" for 1/2", and 9mm prusiks will work with either. Set 1 contains Hitch Climber, 2 DMM Oval biners, and 5/16" Ocean prusik. Set 2 contains Hitch Climber, 2 DMM Oval biners, and 3/8" Ocean prusik. Set 3 contains Hitch Climber, 2 RockO oval biners, and 9mm RIT prusik. Contains everything needed to add climbing on the French Prusik to your arsenal of techniques. Contains: Professionally spliced Bee-Line Prusik, CMI micro pulley, 2 Rock Exotica RockO double-locking carabiners.